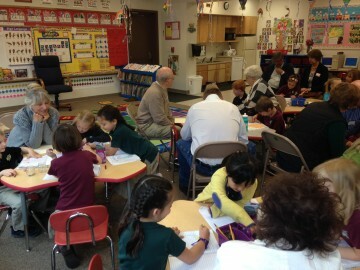 Nanny Jane and Grandpa came to school with us! 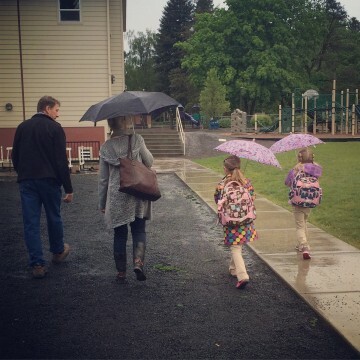 It was a rainy day so we didn’t have recess, but our teachers had plenty of projects for Nanny Jane and Grandpa to help with. Mia’s class put Nanny Jane to work because she was the only grandma at Mia’s table, so Nanny Jane had four grandkids in Kindergarten that day! 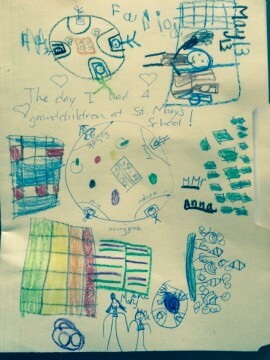 They even sent her home with some of their artwork on her folder, a collage of drawings of the classroom. What a fun day! Can you find something in your life to be happy about today? How about for 100 days in a row? It sounds like a pretty tall order, but 100HappyDays.com is challenging people to attain an attitude of gratitude by simply snapping a picture every day. It started in 2013 as a personal mission for founder Dmitry Golubnichy to bring happiness back into his life. As is so often the case, Dmitry suffered from lack of contentment in a modern life so full of everything. He made a visit back to his hometown, where he tried to express his dissatisfaction to his friends and family, but found that he was met with happy people who were mostly content with their lives. He left promising himself that if all of those around him could find happiness in the everyday, then so could he. Dmitry made himself accountable by posting his intentions and a daily photo on social media sites with the hashtag #100happydays. 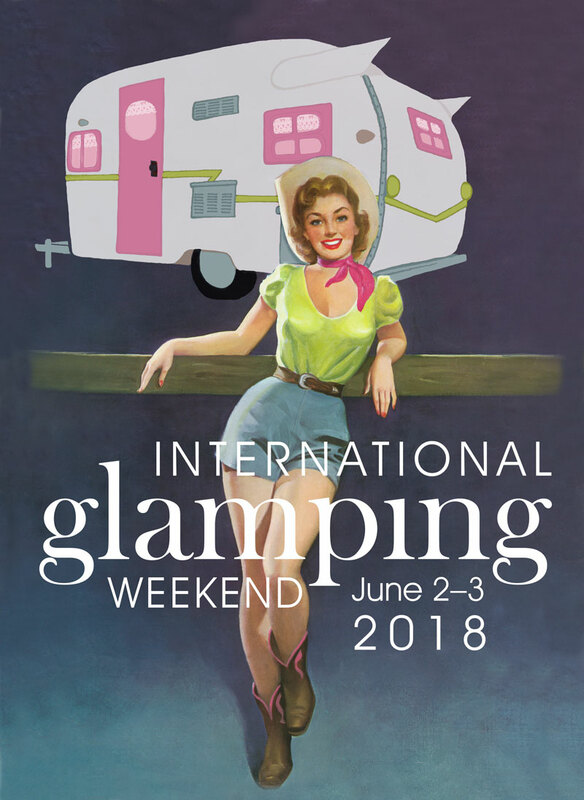 Much to his surprise, his friends started asking to join in, and then strangers wanted to join in, so he launched a website and had a staggering 3,000 participants sign up on the very first night. To date, the challenge has been taken by 1.5 million people from 220 countries! Sounds like lots of folks want to be happier. 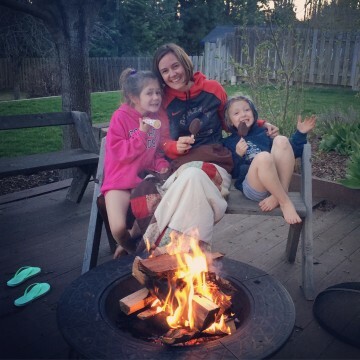 A snapshot of my happy … I am grateful for my children, a campfire, ice cream, flip-flops, sweatpants, and cozy quilts. Intrigued? Visit 100happydays.com to register for the challenge and pick a platform for sharing photos. You can share your pictures on Facebook, Twitter, and/or Instagram with the hashtag #100happydays, or if you’re a little more private, you can simply share on their website or link to your own private space. At the end of the challenge, you can receive a set of all 100 prints to remind you about the everyday beauty of your life.